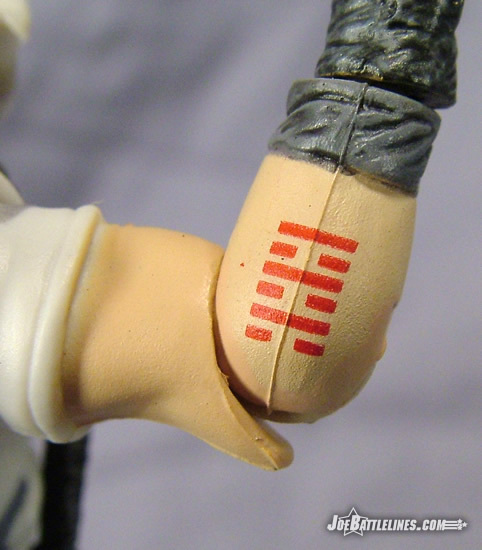 Thomas Arashikage is a man with a muddled past. He’s been on both sides of the GIJoe/Cobra conflict and now he’s set out to find his own destiny in the ongoing Storm Shadow series from Devil’s Due Publishing. 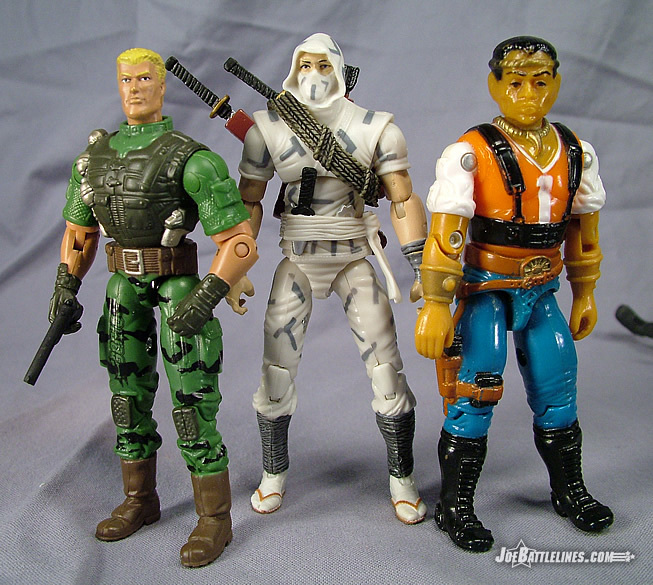 Back when I was a young Joe fan, I absolutely astounded when Storm Shadow broke away from Cobra and eventually joined the GIJoe team. It was the first time in the series that a major character had changed sides and it left such a lasting impression that the v2 Storm Shadow became my absolute favorite ARAH version of the character—an assessment that still stands to this day. When Hasbro first released pictures of the first wave of single-carded 25A figures, I was skeptical. 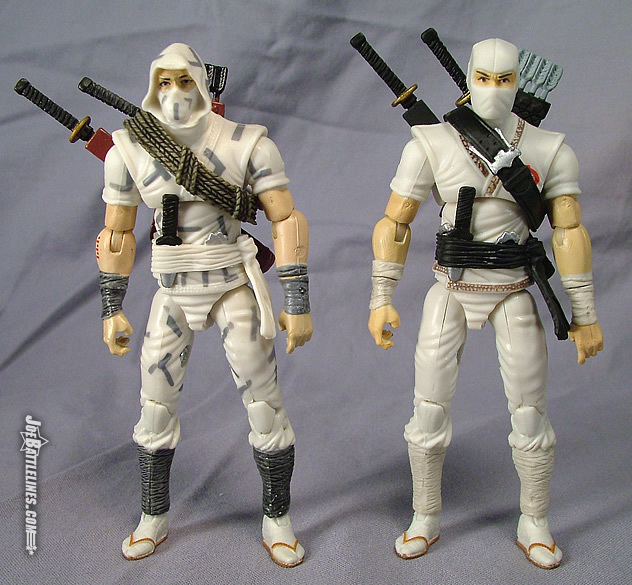 Could this new version of the classic “non-Cobra” Storm Shadow prove as exciting as the original or even the insanely cool VvV wave 4 version? Read on for this GIJoe fan’s thoughts on the figure. I’m starting to feel a bit repetitive in writing the reviews for this first wave of single-carded figures. 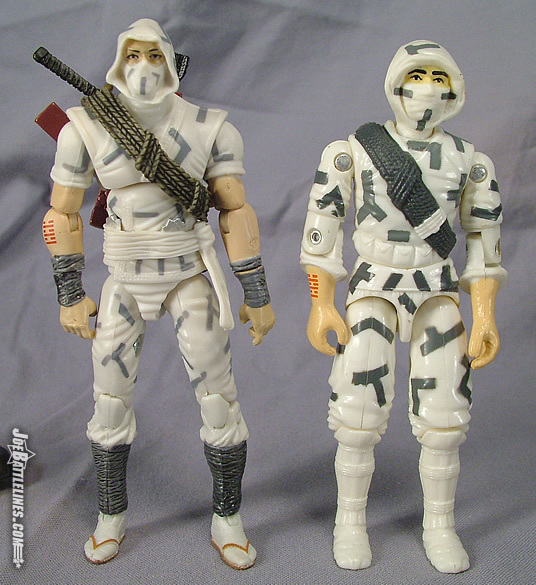 Like all of the other figures in this wave, Storm Shadow’s body is not entirely his own—but instead saw previous release as the Battle Pack Storm Shadow. As such, most of my comments from the previous review still apply, even though I find this version to be a bit more visually interesting. 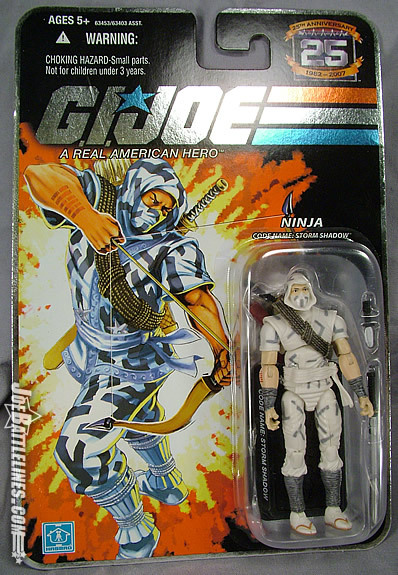 Whereas the previous release of this body saw a primarily plain white uniform, this figure pays homage to the original ARAH v2 figure and adds some urban camouflage to the ninja’s uniform. Gone is the dark piping around the edge of the gei; the paint application seems to have been transferred to the wrappings on his forearms and calves which are now painted dark gray. 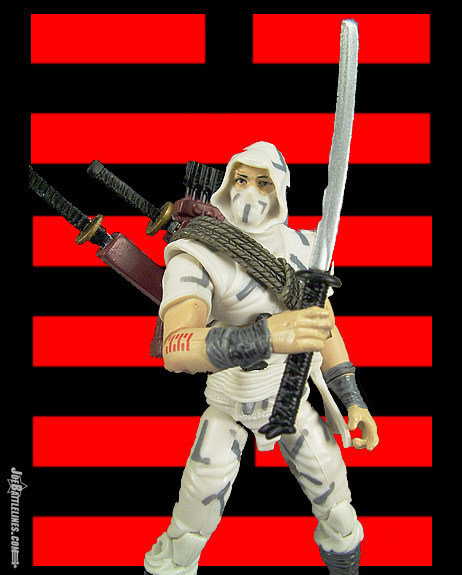 One inconsistency that is caused by the reuse of the Battle Pack Storm Shadow is found in the placement of the Arashikage clan hexagram. In the ARAH version of the character design, Tommy’s forearms were uncovered for the first time and so the tattoo was clearly visible on the forearm. However, as this figure reuses the wrapped arm sculpts from the first 25A release, that tattoo placement was changed to the outer edge of the right forearm, just below the elbow. The only problem with this is that the tattoo should also be visible in the “Cobra” version of the character as well—and it’s not. This is one case where I would have liked to have seen a second set of arms used rather than a straight re-use of the existing tools only because it does lessen the overall effect of this character design as an update of the original. Aside from the tattoo placement, all of my previous comments still apply and I find this to be one of the better body designs of the 25A line. Like the other figures in this wave, Thomas Arashikage is treated to a new head sculpt. As with the single-carded Snake Eyes, the new head seems slightly smaller than the original although the difference isn’t nearly as noticeable this time. The hooded head looks fantastic and is a superior sculpt to the original ARAH version which always felt a bit “wide” to me. 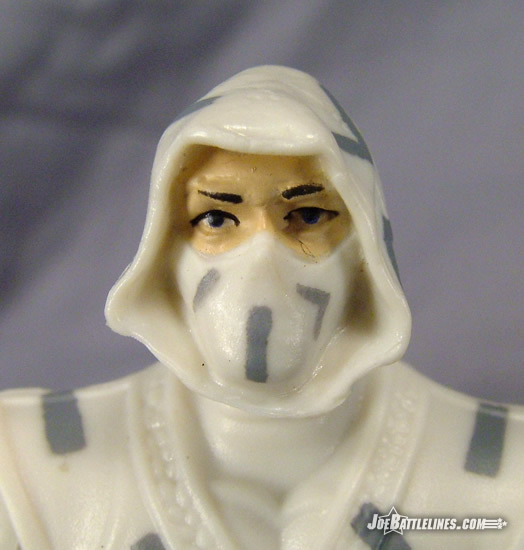 In fact, this head sculpt is uncannily similar to the hooded design used in the GIJoe: America’s Elite monthly series and I’ve no doubt that it’s only a matter of time before someone cobbles together a custom figure of that design using this particular head. The hood looks quite natural, right down to the sculpted folds in the fabric, which simulate the natural fall of cloth. 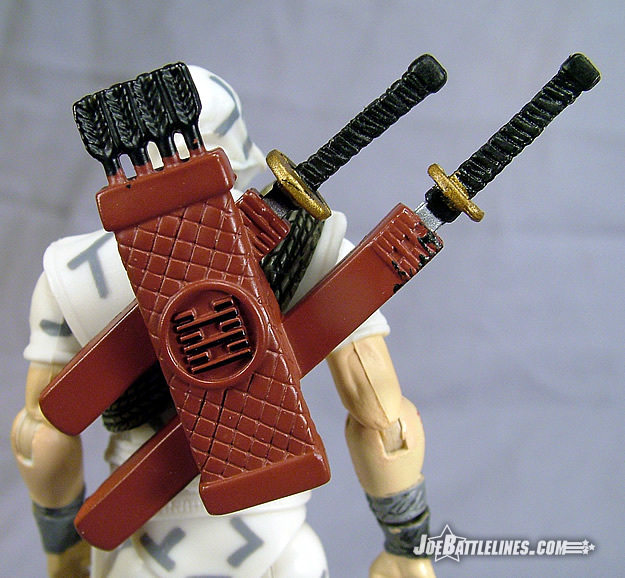 Also included is a modified version of the backpack which came with the Battle Pack release of Storm Shadow. The strap that secured the quiver and scabbards across the figure’s chest has now been resculpted to resemble the coil of climbing rope that was part of the ARAH v2’s character design. I’m not entirely sure if I like this change or not as the sculpted rope doesn’t flow quite as seamlessly into the backpack as the strap from the previous version did. In some ways, this is the figure in the wave that would have benefited the most from a few new parts—including a compound bow. Still, I can’t say that I’m displeased with this figure as I’ve got such a strong preference for this character design. The articulation is exactly the same as on the previous 25A Storm Shadow so there’s no need to discuss that here. 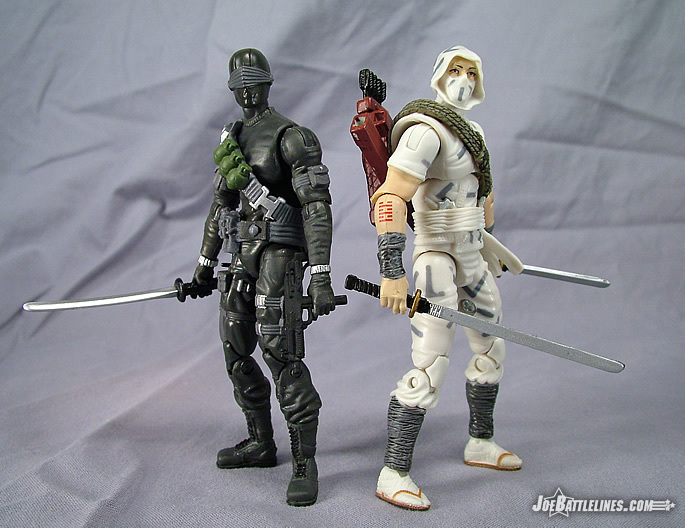 Storm Shadow is packaged with the same weapons as the previous version as well as a faction-specific character stand. (It’s now sporting the GIJoe logo!) His file card is found on the back of the cardboard backing. Storm Shadow is probably the weakest of the figures in this wave in terms of accuracy and yet he’s one of my favorites in this wave simply due to the nostalgia factor. 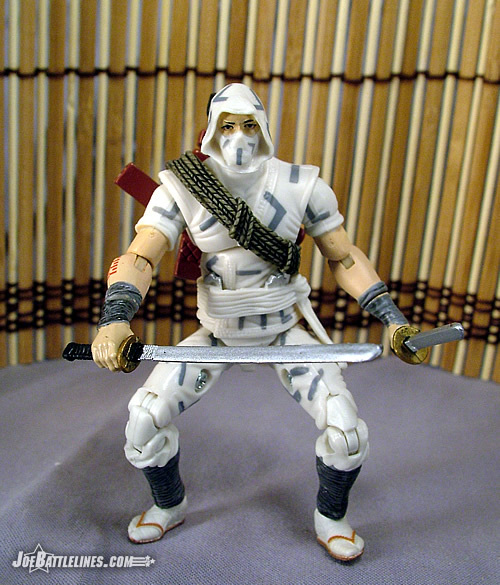 This is the ARAH version of Storm Shadow that I’ve always preferred and so I’m looking at this figure through rose-colored glasses. As with Snake Eyes, this figure is actually in scale with the previously released ARAH and GvC 3.75” eras of figures and therefore can be displayed with both the 25A figures and the classic originals and their more recent counterparts. While I would have preferred to have new arms and a different backpack included, I’m still hard-pressed to disparage the figure simply because of these two cosmetic issues. Storm Shadow is one of the most poseable of all of the 25A figures with the fewest movement restrictions and therefore was a much easier sell for me than figures like Flint and Duke who required modifications to achieve a standard level of articulation. 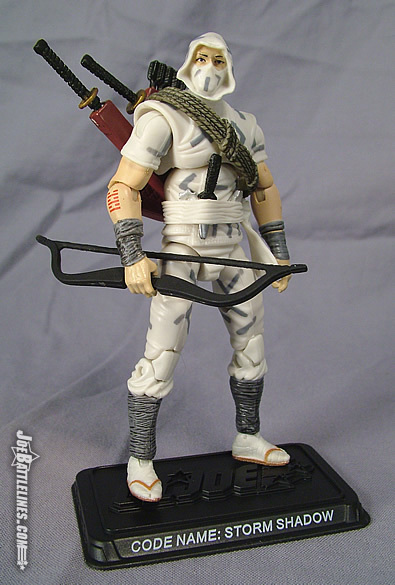 As such, I can recommend Storm Shadow to most collectors as a worth addition to any GIJoe collection. Sure, I’d be happier if he was made in the proven “o-ringed” style but somehow I just don’t see that happening any time soon.